Cricinfo came up with the expression "the spin twins" of Charlotte Russell and Holly Colvin. The report was one that indicated the match had been watched by the reporter and she appears to have enjoyed the game. Of similar colouring and height, the expression is particularly appropriate and I wish I'd thought of it first. CricInfo reported "Russell, like Colvin in 2005, had a late call into England's squad - she made her debut in the Twenty20 on Thursday - and the decision has immediately paid off." 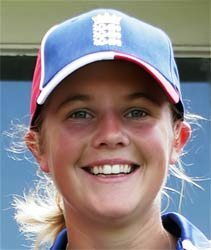 As I type 'Charlie' has played just two games, a T20 and an ODI, but it would seem that already the decision to call her up from the Development Squad was a correct one. It always seemed odd that England were going into a series with only one recognised spinner in Colvin. An injury could have left the team with just a battery of medium pacers and no genuine spinner or strike bowler - not much for the captain to play with in a crisis. 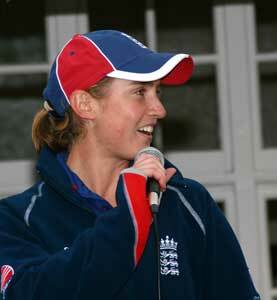 True, Charlotte Edwards can bowl excellent leg spin but it is a discipline where it's hard to maintain consistency. Lydia Greenway is also said to have had an excellent season bowling a slower ball. With one spinner turning the ball in to the bat, and the other turning it away, the present 'spin twins' would seem to be the ideal partnership. The next ODI was called off for the weather. It seemed strange that the venue wasn't moved weeks before as everyone knew the pitch had been underwater and therefore the chances of play virtually nil. We heard just an hour away from Stratford that the inevitable had happened and so we did the tourist bit including enjoying the mandatory ice cream. The pavilion had huge heaters attempting to dry the walls and the timber of doors frames and skirting had been ripped out leaving the ground floor looking a sorry sight. I plodded out to the middle and there was certainly no way any play would have been possible, probably for weeks. Had, during the previous week, anyone checked whether any other grounds within a 50 mile radius been available I found myself wondering. Why 50 miles? - well, although I have never attempted to find out, it would seem moving hotels for the teams might be a more difficult logistical exercise than finding a ground. Perhaps I am wrong. I was especially disappointed about this ground as it had previously hosted what I might call "my favourite match" I won't upset any Australian passers-by, by giving the full explanation, but it's the only ground where I have been able to follow a hog-roast by a soft ice cream. With the match result on that occasion, and an invitation to the team BBQ afterwards it made that a perfect day! This was maybe the most remarkable match of the series although one of the games later at Blackpool could perhaps qualify. Charlotte Edwards was back after injury and England may have thought they had their strongest team on show. There will always be debate about which of the medium pacers should be included and who should give way, but the second spinner ("Charlie") was dropped. England batted first and must have felt, with Claire Taylor showing once again she has claim to be ranked the world's number one batsman, that they had done enough to push the White Ferns to the limit and very probably win the game. 240 is an excellent score especially when the other team has the lights to contend with. However, the crowd were treated to a batting exhibition without parallel this summer when Aimee Mason (81 off 86) and Sara McGlashan (97 off 94) simply took their team passed the total with almost 15 overs to spare. The England bowling, and the crowd, seemed shell shocked and well they might. 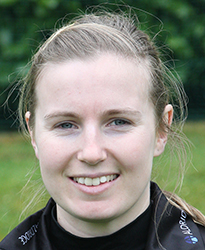 Only Holly Colvin provided any rein on the scoring rate, being the only bowler with an economy rate less than 5 runs per over. The Sussex players in the England side might have been slightly less amazed than the rest for Mason's time with Sussex a year or two ago indicated there was a mighty hitter lurking. Indeed she is the only woman I have seen hit three consecutive sixes and, if memory serves, they all cleared the rope more than 10 feet above the ground. On another occasion at Invicta's ground there was debate among the spectators about moving their cars as Mason three times deposited the ball in the parking area, twice, fortunately, landing it on a soft-top. So often you hear commentators on the TV mention that the batting side had "enough" runs in the over for the required rate and so it wasn't the time to be expansive. It seemed the New Zealanders hadn't heard this advice. If the ball was hittable it was hit whichever delivery in the over and however many runs had gone before. In that sense it was refreshing and I can't say it's a concept I have ever agreed with. If you let a full half volley pass you by to the keeper you may not get another for several overs. Take what you can - and the White Fens did just that. Unless you've managed 36 runs there is no such thing as 'enough' in an over. If this kiwi form continued England wouldn't just be beaten they'd be humiliated. [September] Blackpool is not a ground I have been to before. I gather Lancashire men use it as a second ground and I am therefore slightly surprised at its dilapidated condition. True the pavilion seemed fine and a grassy bank at the far end proved perfect for parking the car and watching from the front seat out of a chilly wind, but some of the fencing and buildings were distinctly lacking a coat of paint. The scoreboard also was something of a joke and rarely (never?) gave an accurate picture of what was going on. So well prepared were the club that on the first morning the boundary rope was laid out by a willing spectator or a late start would have resulted. Power problems also gave the NZ and England analysis staff a slight head ache although all was resolved in the nick of time. New Zealand won the toss and opted to bat. Suzie Bates went early which must have been a relief to the England bowlers but Aimee Mason continued her run of form, gaining her second one day century. Her stats are rather unusual in that she has 2x50s and 2x100s to her name but only an average in the 20s. With McGlashan and Tiffen also going cheaply England must have hoped they would have a lowly score to chase but other kiwis chipped in with a few and the 239 must have disappointed the bowlers. Twenty five of them were gifted in the form of wides and no-balls and England really needed to sharpen up here. Laura Marsh was the leading wicket taker and Sussex team mate Holly Colvin once again proved difficult to get away. Claire Taylor again showed her class but could find no support until Lydia Greenway appeared at number 5 in the order. After their departure Beth Morgan, showing real grit, made a valiant attempt to hold the ship together but it was not to be and the match and the series faded from England's grasp. Morgan's ability to stick it out was to pay big dividends later in the series. Could England manage to regain the form that helped them claim the first two T20 matches? Certainly I had seen little sign of it apart from a few individual star performances. In particular the fielding, always an indicator I feel of how confident, or how determined a side feels, lacked the sharpness exhibited at Bath. Where had that extra energy gone? No one leaving the ground that day could have had the slightest inkling of what was to follow. On day two at this venue NZ once again won the toss and decided, very logically, to bat. When wickets started falling like nine pins (1-24, 2-24, 3-25, 4-29) I began to wonder what was going on. Aimee Mason was injured but she was hardly the only fire power NZ had. Wandering round to a point behind the bowlers arm it was obvious the ball was swinging through the air, which it had shown little inclination to do the day before, but these batsman must have batted in such conditions before. True it didn't make life easy but when the final wicket fell at a mere 72 runs I was still perplexed - just one of those things I guess. Jenny Gunn and Isa Guha bagged four wickets each and Nicky Shaw finished with half her overs maidens. Although Charlie Russell had been re-introduced to the side, the spinners were redundant in these conditions. When England started their innings, Sarah Taylor showed exactly what she could do, ironically in more difficult conditions than those in which she had been less successful earlier in the series. Other batsmen found the conditions as difficult as the kiwis had done until Jenny Gunn stuck it out and if there was one regret in my mind as England completed a 6 wicket win, it was that Taylor had missed her 50 by just one run while remaining not out. I try and remember to photograph the scoreboard at the fall of each wicket. It helps me identify batsmen when I have problems guessing the face often in strong shadow and partly hidden under a batting helmet. Reference to the scorecard gives me only two batsmen to choose from! At Blackpool the vagaries of the scoreboard made this impossible. Even at the end of the match I hoped the umpires had kept an accurate check. How different was this from Taunton where every stat is quickly and faithfully recorded? ... for apparently that is at one time what the Shenley ground was... I am told it used to be possible to sit watching the game and pick part of your lunch from the few remaining trees. In dry weather it is certainly a splendid ground even if the parking attendants can be a little vigilant and the commentary frankly appalling! Some spectators had the sense to 'accidentally' pull the leads from the ground speakers to avoid the inanities they were being regaled with and I salute their pragmatism! If you had to listen to it, it would have completely ruined the day. A government minister turned up - I didn't know we had a Minister for Equality - and left after an equal 15 minutes or so. What 'equality' she is responsible for I have no idea but give me any subject you care to mention and I don't think you'll find she's having any success (except perhaps with her own salary in relation to her male counterparts). With Aimee Mason still injured, NZ were not to be at their strongest. Roz Kember came to the party after a poor run, providing the backbone of the innings and Nicola Browne's quick-fire 38 made the final 206 total respectable though not intimidating. At 76-4 however, the England reply wavered. Opener Beth Morgan was still there and over the subsequent overs looked like she might steer England all the way home. However her dismissal and Jenny Gunn's very shortly after threw everything into the melting pot again. England supporters need not have worried. Nicky Shaw bisected two boundary riders with perfection to take the home side to the finishing line with just a ball to spare. There was no doubt where the Player of the Match Award would go - it was hard earned - and Beth Morgan's innings that day and the one during the first game at Blackpool showed real courage and determination. 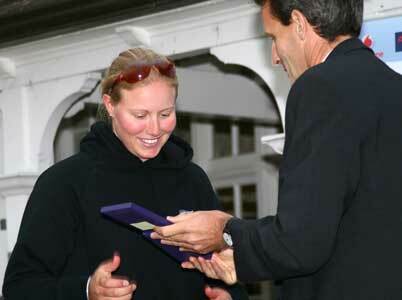 There could be no quarrel either with Aimee Mason taking the Player of the Series Award.